'Bloodline' sealing tag on the front of the optical, in which keeps back all effects of it. Because Saruno is of the Kazura clan, and possesses the ability to shape the hair color, wing colors, etc. with the temporal change of his emotions, his hair is mostly a nice shade of black when he is in his 'casual' sort of way. And last but not least, the wings on his back, when in a dark sort of way, are a nice shade of black, which absorb a lot of heat, in an obvious sort of way. The feathers on each of the wings are purely real, grown from birth and can have the ability to fly. When Saruno had the wings to a point where the cloak he was wearing didn't hold the wings all so snugly, he fitting the back of his cloak to two large zippers, where he can slip the wings from under his cloak to out upon his back, out of the snugness of the cloak. When in such a state in a casual kind of an 'Advanced' battle state, he has the ability to . His eyes are just a plain crimson, or maybe a few streaks of white and black in between. He wears a full-length jacket that wraps around his torso all so snugly. This jacket contains a vast amount of chain, crossing over his shoulders and the sides of his stomach. With these chains at hand, he can swirl them off the jacket and use them for offensive of defensive purposes. There are also two bucklers that hand out in a 'U' like fashion, acting like small balancing area. In other parts of his body, he wears a small eye-patch on his right optical, keeping it from anyone sight. This eye patch is a nice black hue and covers his entire optic to the eyebrow and a small bit below. A string is attached to both sides to keep the patch stable. Due to a condition, he cannot remove the eye patch unless certain doom is upon him. Besides that, Saruno also wears a small gauntlet, on his left and right wrists, holding each a mechanism inside of them. These mechanisms are made purely of a steel-like substance, and can be utilized for the Raiton Elemental Release. The mechanisms can be hidden in the socket of it, and be retracted to over 2 feet in length. These metal spikes can also be used in offense and in defensive purposes. Shy: When Saruno is in a shy state of mind, he tends to wear a set of white or brownish clothing, best suited for this kind of emotion. This clothing is best made as an arched-open shirt or jacket, and a set of brown/white pants, which have at least 2 or three side pockets on the end of the leg areas, below the main pockets. His hair is mainly shifted to a brown-type of shade, a bit within a shiny-sort of way. And a scary part of this state of Saruno's being, a set of pure 'Neko' ears lift up on his head, obviously making it a shy state. In this state, and saruno's type of emotion, Neko's are prematurely extremely shy, thus, being in this state of mind. He continues to wear the bandage over his right optical, nothing in between or anything else. But on occasion, his eye can return to it's normal state and be it's normal shade of red or brown. With the ears, small bits of hair can come out to the size of maybe a pencil, about four to ten hairs in each ear, to help with hearing, but they don't show that often, especially when he perks them back against his hair, to attempt to hide them. Berserk/Battle: Within Saruno's 'Berserk' state, many types of things overcome his body within mere moments of time. On his upper torso/arm areas, with the Blade of Chaos at hand, small bits of flame begin to first engulf the entire portion of the arm, causing small formations of black armor, detailed with the picture of a Falcon or Raven. Each inch of the metal-like substance created on the arm, small spikes appear near the edges of each, the detailed line of the wrist guard putting into a formation of a Raven, it's metal wings pushed outwards around his hand, keeping it on the sword at all costs. The Same thing happens with the other arm, putting the exact same image in it's format. While the flame travels across his upper torso, the chest plate armor forms with a bit of ease, the chest plate showing not much of his clothing underneath it, but burning it slightly away. 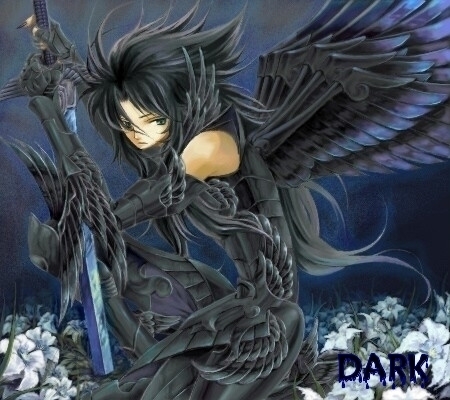 As the blackness of the armor forms, it shows to have raven/black falcon pictures showing on it's right torso flank. Small lines, like an oceanic wave curves upwards from the left flank, up towards his skull. When it reached Saruno's skull, a purple flame begins to race over his head, forming a pitch black armor, curving upwards over his right eye, going just under the top of the hairline, showing the full picture of his hair, a dark color, black. When the armor forms on Saruno's wings and back, small curves of armor form on the stems of his wings, curving a bit more, but making sure they have enough room to be able to glide through the air with ease. Moving down onto the lower torso and the legs, armor is placed along the sides of his body, and around his crotch area, protecting it from harm in all ways around. As for the leg armor, the armor slides down the front and back of the legs, leaving the sides the only thing open for any kind of major contact damage at all. No armor is placed on the feet. Normal/Everyday Life: Within Saruno's everyday life, which is his usual, emotionless state. 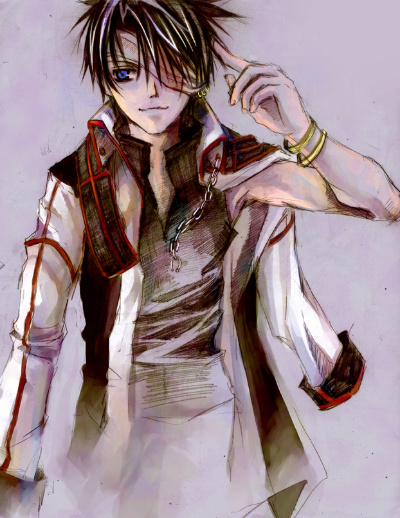 He mainly has just his regular clothing, a typical white and crimson shaded jacket and bandages around his right eye. (Not in tone with pic.) The jacket contains of a small scroll in the center pocket in the left flank of the jacket, holding his Tou no Ranmyaku quite steadily. Just in case he needs to use it. Also, he keeps a steady amount of kunai and Shurican in his right sleeve, in case he needs to use it out of bounds. And that is the appearance of this type of emotional setting. 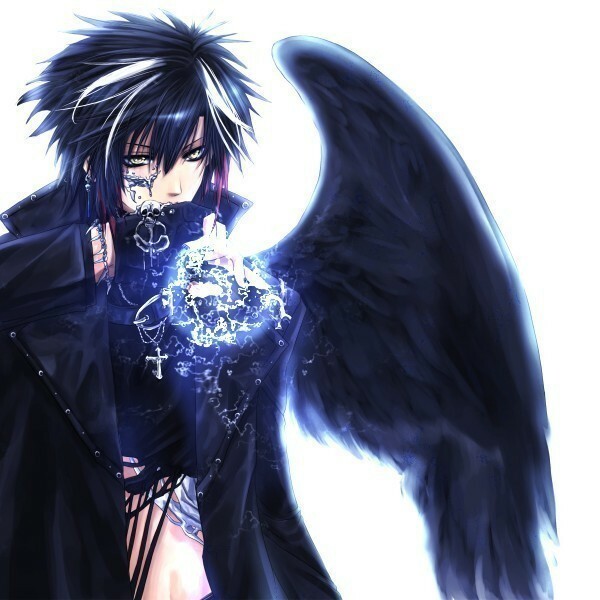 Personality: Saruno has a multitude of personalities, having from one thing to another, each differing with his hair, eye, wing, or even skin color. Each one has it's own abilities, it's own causes, and it's way of life for him. For a natural sense, outside of his usual nature, he would swear to protect his loved ones, the people who are his friends, the ones who he cares for in all ways around, he is the one, who he thinks can help everyone survive a tragedy. But, he tends to be get very emotions when he is reminded of his past, his father's death, and about when his clan was faded to nothing but a few of his kin. The natural sense of himself would be to do whatever he can to protect, nurture, and help his family and friends survive, no matter what would happen to himself. And for an extra tip, he can get depressed really easily. Within his shy kind of state, he tends to blush uncontrollably when he's around a person he likes, or, is flirting a bit with him. Saruno doesn't exactly like that too much, especially when in such a state. To makes things just a bit worse, he tends to stutter in his words, tripping over himself, or something else that would just embarrass him more in his life, reason why he was so shy before, was because the war between the Narame and the Kazura, when he captured and....'interrogated' with a few of the Narame female members. He hides his feelings, and himself when in this state, when his Neko-like features begin to show, it just makes it even worse for him. On his normal/everyday life sort of personality, he is a bit formal, or playful for that matter of speaking. When he's around somewhat of his superiors of a higher strength, power, or respect, he tends t kneel, or bow when he speaks, or is just being a bit formal. He doesn't like to be so formal in some cases, but it's a habit of his, especially when he was a small boy. Even though he was a bit spoiled back then, he always tended to do other things in his time, being taught proper manners and such, only for him to be this way. When talking to people in his playful sort of voices, he tends to tell a couple jokes or two, or just being his usual emotionless self, not talking to mainly anyone at all, or just being him, either way, it's just Saruno. 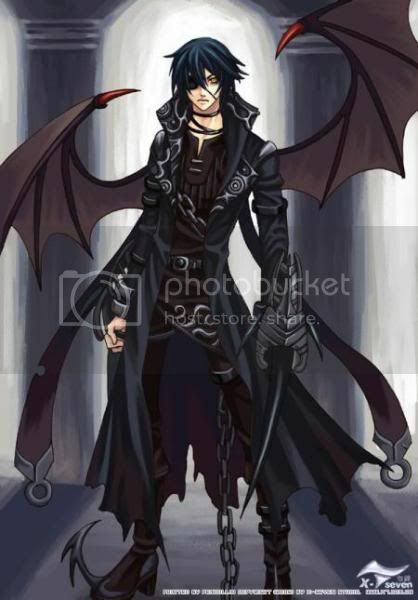 As for his Berserk state, battling style, his mind tends to turn to a more, evil, playing kind of side. He has this urge to turn cannibalistic and attack anything and everyone that wanders into his sight. His attacks are mainly hyperly powerful, attacking at any angle his fighting style tends to. While within the control of his blade, Yuui, he will attack with much more force, skill, and precision that most of his main tactics, hitting more of pressure points, or other places that make a shinobi weak. Slashing away at his enemies, Saruno is able to cut down even the mightiest of foes, but has a distinct weakness, within the Berserk state, he'll kill anyone and everyone that stands in his path, the only way to get him back into a normal state, would be as if someone could reach into his mind, and remind of what is in reality.